Easter now commonly thought of as a Christian holiday, actually has its origins from pre-Christian pagan cultural tradition. 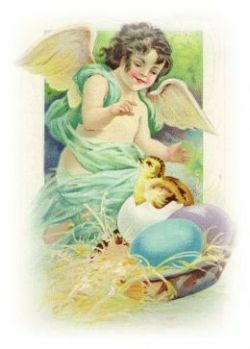 Easter is thought to be named after "Eostre", or "Eastre".a Germanic mother goddess of spring, re-birth and fertility. 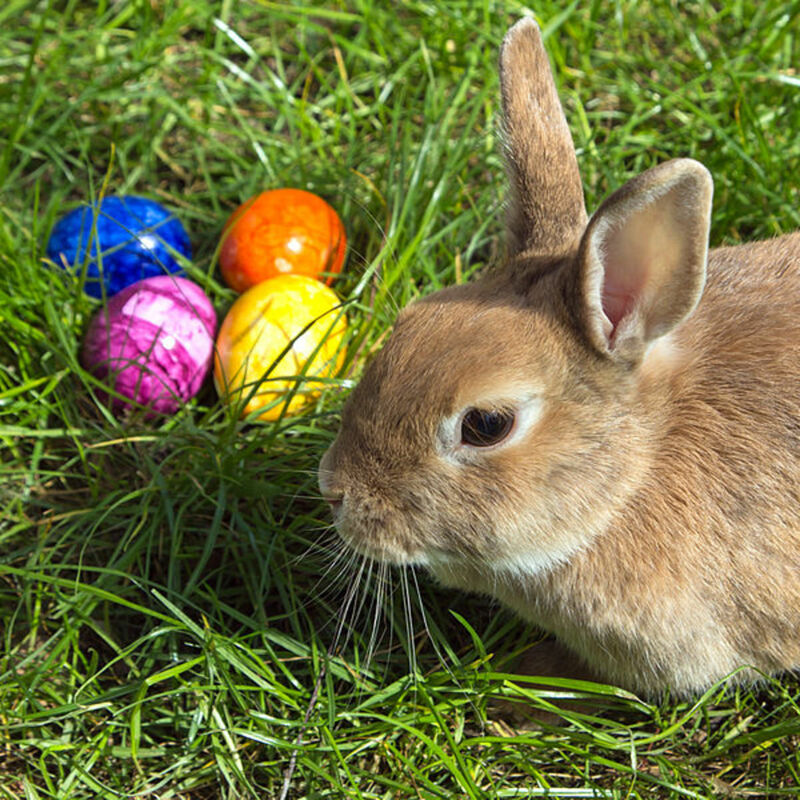 Eostre's festival was celebrated on the spring equinox and highlighted symbols of fertility such as rabbits and eggs. 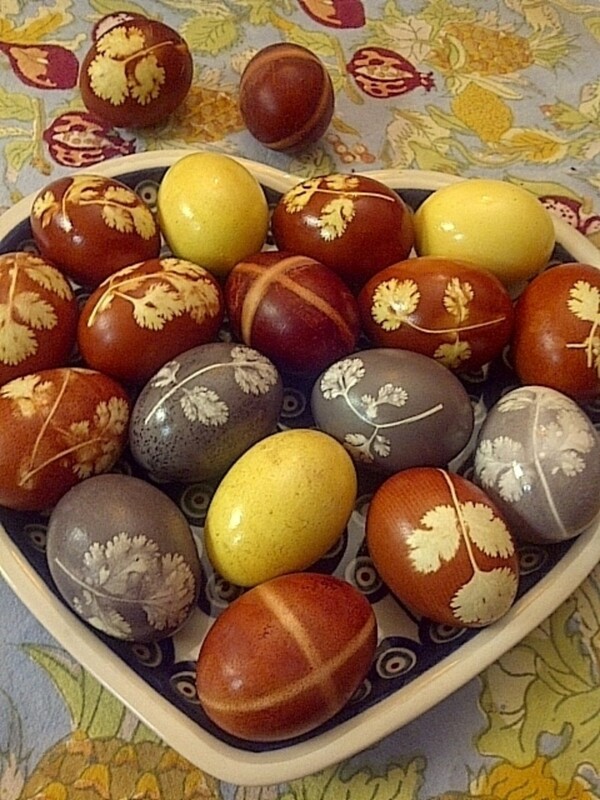 Easter eggs were painted in bright colors to represent the colors of spring. 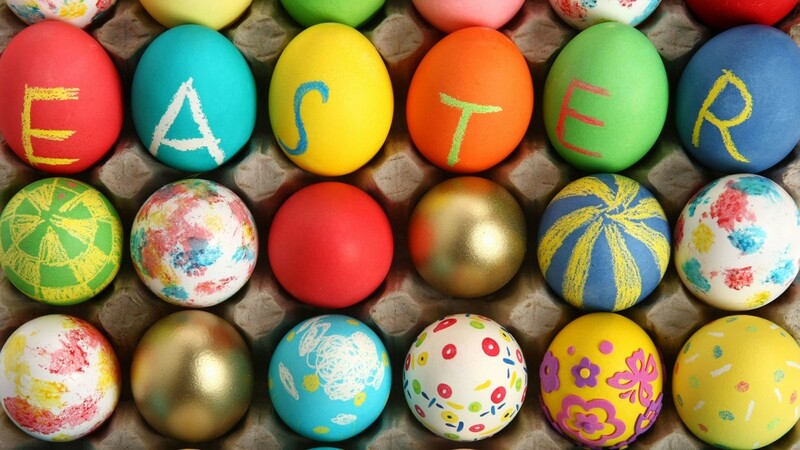 Early Christians replaced the pagan festival with Easter celebrating the resurrection of Jesus Christ. It is now a "moveable feast" that is celebrated on the Sunday following the spring equinox between March 22 and April 25. Burst of Spring Colors Tabletop Easter Egg Tree in Metal Bucket for Easter or Baby Shower Centerpiece - Cute Spring Decoration! 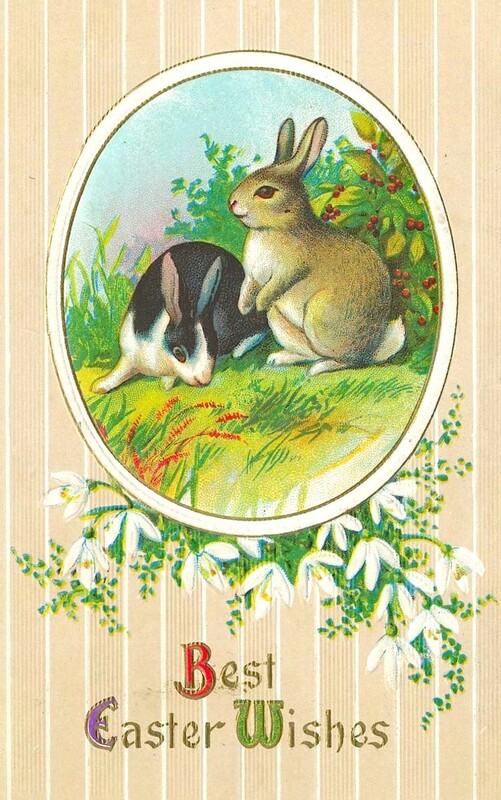 The rabbit, or hare, was a thought to be a fertile companion to the pagan goddess "Eostre" (or "Ostara"). 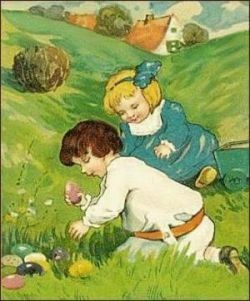 German settlers in America are also said to have brought over the tradition of a bunny named "Oschter Haws" who visited houses the night before Easter and left colored eggs for the children. Across the world there are myths that claim that our universe was created out of an egg. Thus, it is not unusual that in almost all ancient cultures, eggs are held as a symbol of life. At the Passover, "Seder", a hard-boiled egg dipped in salt water, symbolizes both new life and the Passover sacrifice offered at the Temple in Jerusalem. 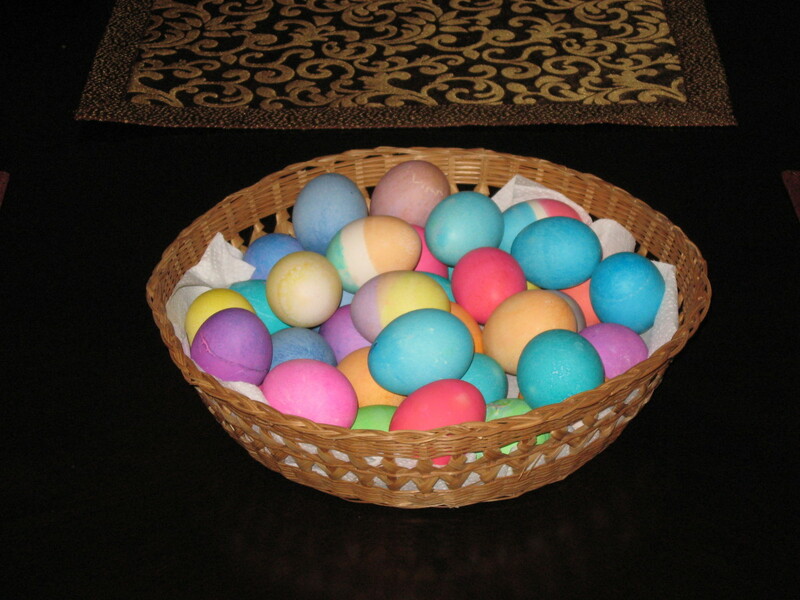 In Christianity, coloring the last of a household's eggs may have celebrated the beginning of the Easter season. 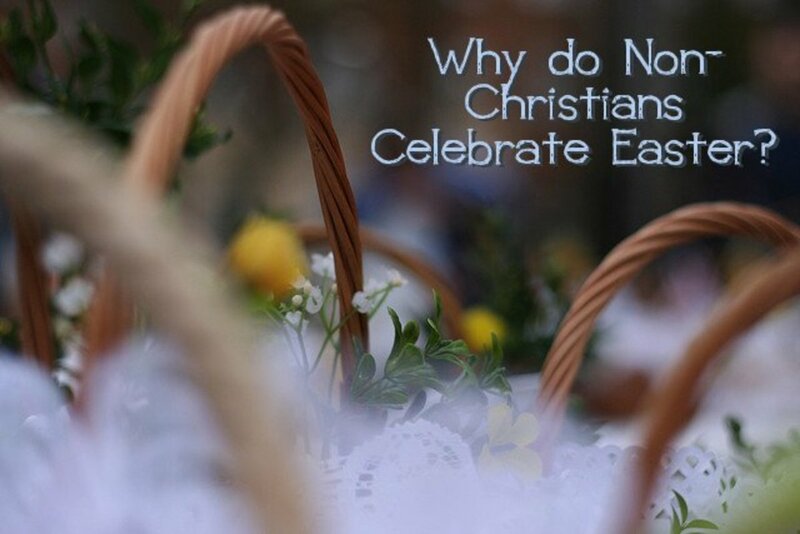 This tradition began in medieval Europe prior to Lent's forty day fast that forbade the eating of eggs. One myth claims that any eggs laid on a Good Friday, would have their yolks turn to diamonds after one hundred years. Another legend says that If eggs collected on Good Friday were cooked on Easter Sunday, they would promote the growth of trees and crops. And, it was once thought that you would become rich if you found two yolks in an Easter egg. Easter Bunny Nesting Egg 5pc./4"
Easter Lilies- The white blossoms of the Lilly symbolize the purity of Jesus Christ. 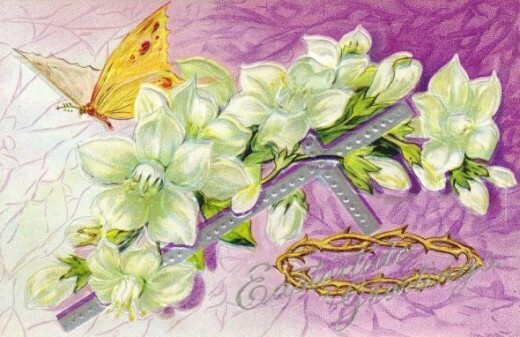 The emergence of lilies in the spring, also symbolized new life and the resurrection of Christ. In Roman myth, white Lilies represents the queen of gods, Juno. It is said that when Queen Juno was feeding baby Hercules,drops of her milk fell from the sky to form both the Milky Way and white lilies. The Lamb - The Lamb is the oldest of the Easter symbols, and was originally offered as a gift to the Gods. In Christian tradition, the Easter lamb stands as a symbol of God sacrificing His only son "the Lamb of God". The Cross - The Cross symbolizes the crucifixion of Jesus Christ, reminding us of the sacrifice He made for the sins of man. An empty Cross, on the other hand, symbolizes Jesus' victory over death, indicative of the resurrection. Thus the Easter Cross is a sacred symbol of faith, representing both the crucifixion and the resurrection of Christ. The Butterfly - is a significant symbol of Easter. It's whole life cycle is meant to symbolize the life of Jesus Christ. In the first stage, the caterpillar; stands for "His life on Earth". The second phase begins from the cocoon stage; portraying the "Crucifixion and Burial of Jesus". The third and final stage, is the complete Butterfly; representing "His Rising from the Dead and New Life". Hallelujah! He Is Risen Rejoice in the gift of eternal life with this heavenly helper during Easter and all year long! Masterfully crafted from stone resin for a "wood carved" appeal, this Easter angel figure is designed in a myriad of eloquent patterns and colors infusing Jim Shore's distinctive style with a cozy country charm you'll love for years to come! Easter. Yom Kippur. Ramadan. Hungry Ghosts Festival. Every calendar in the world is shaped by its cycle of festivals. These holy days provide communities with occasions to meet and retell stories of creation and destruction, triumph and defeat, love and loss, and the battle of good over evil. Chapters highlight where each faith's religious calendar year begins, the history and origins of each event, its significance, and how the holiday is celebrated around the world. In addition, the book covers major secular festivals, including Thanksgiving, Halloween, and Kwanzaa. Easter in Sweden, traditions and celebration! I love reading about the Celtic, Jewish and pagan origins of our Christian holidays. This is a beautiful lens! ~ Always wondered about the meaning of the Easter Lily and you answer that. Well done! I always wondered about the egg thing. Now I know! Thanks! you love comments and I love this fabulous lens. Beautiful! As well as being a wonderfully enjoyable read the look of the lens is superb! Blessed. Your lens is being featured on Easter Time Headquarters and would appreciate a lensroll. Thanks! Very interesting, nice work! Easter is late this year, I didn't realize it was almost in May. Nice work! I think a lot of people forget about the true symbols of Easter. The bunny is kind of rammed down your throat. I enjoyed your lens! Five stars and lensrolled at Easter and Spring Sentiments . Hi, Michelle -- Your page about the Easter symbols is lovely. I hope you will consider submitting it to my new Easter Time group. I have plans for a section about the religious meaning of Easter and think your lens would fit nicely. You do such good work! I am in the process of updating my Holiday parking lens for Easter and I am going to feature this lens on it. Glad to see another super lens!